ELLSWORTH, Maine — Federal fisheries officials have issued the final version of a new rule aimed at protecting whales from getting entangled in fishing lines that connect surface buoys to traps on the ocean bottom. The rule requires lobstermen to use multiple traps with each buoy (gear configurations called “trawls”), when fishing beyond a designated exemption line off the Maine coastline. The exempted area encompasses about 70 percent of Maine state waters. Beyond that exemption line, however, the minimum number of traps required per vertical line ranges from two to 15 depending on how far out from shore the traps are set. Outside the exempted area, lobstermen will not be allowed to fish “singles,” which are configurations of one trap per buoy and no ground lines. The new rules are aimed at reducing the number of vertical buoy lines in the water column, which federal officials say pose an entanglement threat to whales. The regulations won’t go into effect for Maine fishermen until June 1, 2015, well after this year’s busy lobster season winds down. Regulators predict the new rules will reduce the amount of vertical fishing lines in the water by between 30 and 40 percent. The new federal rules are a follow-up to regulations implemented in 2009 that required fishermen to use sinking groundlines between traps on their multitrap trawls. Those rules also are aimed at preventing whale entanglements, but fishermen say it has helped to increase their operating costs at a time when the price they get for their catch is still languishing well below what it was in the mid-2000s, when they averaged more than $4 per pound. In 2013, Maine fishermen on average earned $2.89 per pound. The rules, according to an official with the state’s largest lobster fishing trade group, are expected to complicate an already challenging economic outlook for Maine’s lobster industry, which in recent years has struggled with increased expenses and decreased demand for product. According to McCarron, the new rules for buoy lines do not include some exceptions that the Maine Lobstermen’s Association had hoped might make them easier for fishermen. She said the group had asked that the waters around several islands be exempted from the new rule. Federal officials did create quarter-mile exemption zones around Matinicus, Monhegan and Ragged (also known as Criehaven) islands but not around others requested by Maine Lobstermen’s Association, such as Metinic and Seal islands and Isles of Shoals. “We were a little disappointed,” McCarron said of some of the provisions included in the rule. The reason for allowing singles to be used around Matinicus, Monhegan and Criehaven, federal officials indicated in the published rule, is because the water around these islands tends to be less than 30 fathoms deep and to be fished by small boats that could face increased safety hazards by having to deal with multitrap trawls. Terry Stockwell, director of external affairs for the Maine Department of Marine Resources, said the new rules also require all lobstermen in Maine, Massachusetts and New Hampshire to mark their buoy lines with matching red marks at either end of the line and in the middle. He said the Department of Marine Resources objects to this requirement because it is not specific enough. If a rope with such markings shows up on an entangled whale, it’s not going to provide useful data about where in the Gulf of Maine it was caught, he said. He said the Department of Marine Resources also wishes more offshore Maine islands had exemption zones around them. He added that the department hopes it can convince federal officials to revisit some of these decisions in a few years, after regulators have had time to assess how effective the rules are. “We’re going to stand by and implement the rule and work with fishermen to help them be compliant [with it],” Stockwell said. — Two traps on each buoy set outside the exempted area and up to three miles out from shore. — Three traps on each buoy set between three and six miles out. — Five or 10 traps (depending on location) on each trawl between six and 12 miles out. — 15 traps on each trawl set 12 miles or more from shore. 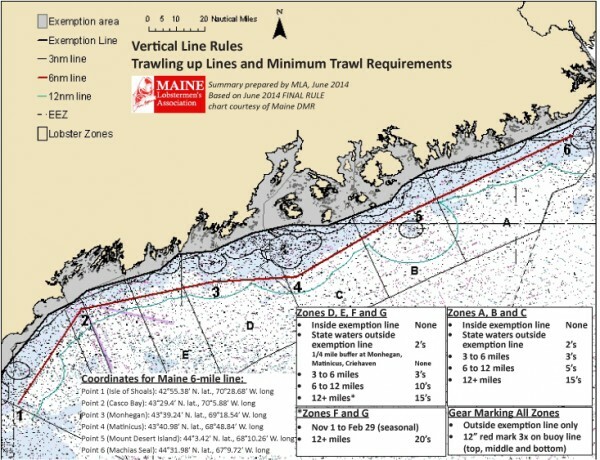 According to McCarron, the 15-trap minimum for trawls set out beyond 12 miles also poses safety concerns for some fishermen. Smaller boats that may have fewer hands on board are expected to face more potential hazards by setting and hauling such long trawls, she said. “They’re going to be struggling with safety fulfilling these trawling requirements,” McCarron said. Prior to 2009, many fishermen, especially those who fish in areas with rocky bottoms, had preferred to use float rope between their traps. The float rope rose toward the surface between traps, which fishermen said reduced entanglements with the rocky bottom and helped extend the life of their gear. But whale conservationists argued, and federal officials agreed, that the arcs of rope posed an entanglement hazard to whales. Floating ground lines were banned, forcing fishermen to buy more expensive sinking rope, which they say wears out faster and breaks more easily, leading to a higher percentage of traps being lost on the ocean bottom. The 2009 rule change did not address the use of buoy lines, however, and resulted in more “singles” being deployed because many fishermen didn’t want to use sinking ground lines. The new rule announced this week is designed to encourage increasing the number of traps on a trawl in order to reduce vertical lines in the water and curb whale entanglements. The tighter rope restrictions adopted five years ago and this year are a result of the Endangered Species Act and the Marine Mammal Protection Act, which require the federal government to take action to protect certain species of animals from harm. The population of North Atlantic right whales especially has been critically low, though it has crept up slightly in recent years. The projected overall costs of complying with the new vertical line rules for the entire Northeast lobster fishery are estimated to be between $1.5 million and $3.6 million, according to federal officials. 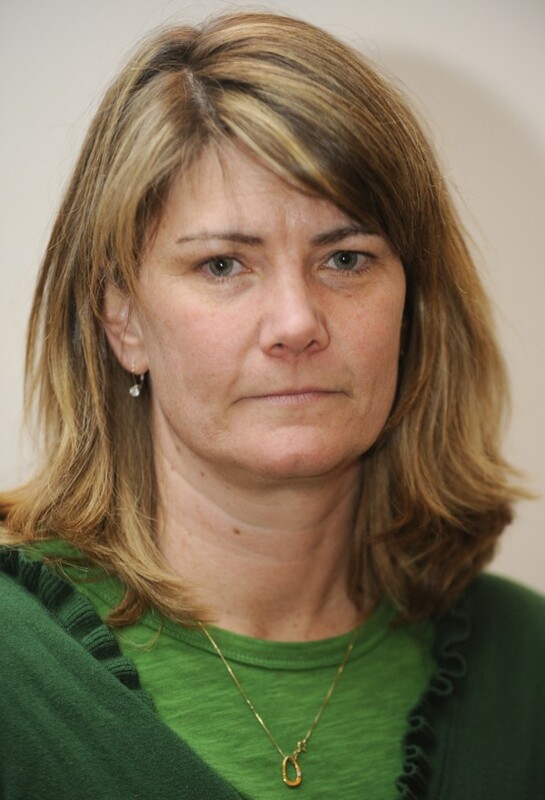 McCarron said that despite this expected economic impact, the process by which the rules have been adopted is an improvement over five years ago, when federal regulators used a “one-size-fits-all” approach to Maine. This time, she said, regulators were willing to consider and adopt different rules for different areas that reflect how fishermen in each area ply their trade. “We’re very pleased with the level of responsiveness” to the varying fishing conditions and practices along the coast, McCarron said.